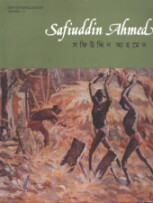 From the Foreword: "Safiuddin Ahmed is a distinguished name in the art movement of Bangladesh. A colleague and contemporary of Shilpacharya Zainul Abedin, he is a dedicated purist who helped establish modern art in Bangladesh. As an artist, he was already famous in the 1940s. Trained in the Calcutta Government School of Art, he was able to develop a distinctly individualistic tone and tenor in his creative work.